After much training, the day had finally arrived. After a laid back drive up the M1, enjoying the views of snow covered fields and white skies (fortunately some grass began to appear the closer I got to Milton Keynes) I arrived at the Windmill that the Caldecotte Arms is built around. This would be race HQ for the next four days. I picked up my number and chatted to some familiar faces. It was brutally cold outside, and set to stay sub zero all day. I have never worn two long sleeve tops for a race before, but it turned out about right. We were led across to the start by "Foxy" Davy, the organiser. Although the race consisted of 7 laps of Caldecotte Lake, running right past the pub, there was an extra mile and a half section at the start, away from the pub, to get the distance up to the full 26.2 miles. undred metres. I soon passed the tent and drinks table marking the end of each lap, only 7 laps to go! I quickly settled into a nice, relaxed steady pace. This was only my second race wearing headphones but it helped tremendously. With the pack spread thinly around the lake there wasn't much chatting to be had and the music kept me relaxed and focussed. The laps passed slowly, each one was 3.55 miles, but I chipped away at them steadily and before long I was half way in 2:02. The course was intricate and compact, with the windmill in sight for much of the loop. The edge of the lake twists in and out and I found I was often looking back across at where I had just run. Being around a lakeside path, the course was inevitably flat, but with 3-4 slight inclines, just enough for me to walk at least a few paces up each one. Otherwise I ran the entire course. Coming into the end of laps 4 and 5 I felt sudden fatigue, with an urge to stop and have a rest. It was just a need for food and water and jelly babies and peanuts and some caffiene soon had me feeling good again. There was a bit of ice on the path, but nothing to worry about as long as you kept your eyes open. I slowed a little on the last couple of laps and felt some cramp in my calves on the final lap, but not enough to need to stop and stretch - always frustrating when you otherwise feel good but your legs refuse to move! I passed the line in 4:11:29, collected my medal and headed straight for the pub for a steak and chips with a Guinness to start the refuelling. I was pleased with my time, just inside my target of 4:15 each day, although I really don't see me hitting that tomorrow. I'd guess at 4:25 right now. The running was easy but the bitter cold really sapped my energy. Im surprised how thirsty I have been in the few hours since finishing, given how cold it was. That was my 30th marathon. Here's a link to the route on Strava. 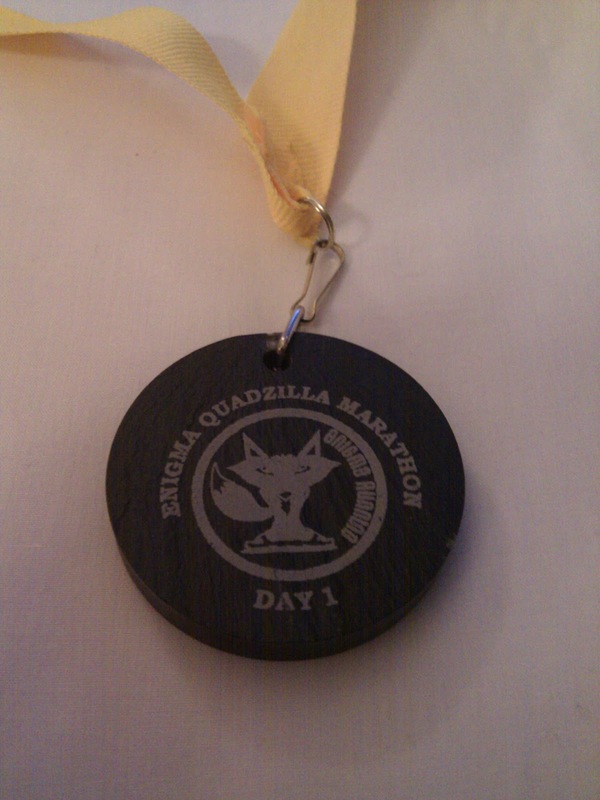 I was 20th out of 60 finishers. Here's looking forward to tomorrow. Same time, same place!